As many sensor networks are currently being deployed for environmental monitoring, there is a growing need to develop systems and applications for managing, processing and retrieving massive amounts of data generated from those networks. 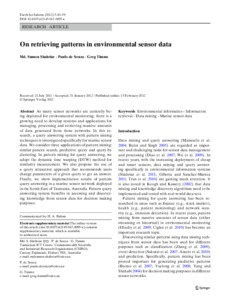 In this research, a query answering system with pattern mining techniques is investigated specifically for marine sensor data. We consider three applications of pattern mining: similar pattern search, predictive query and query by clustering. In pattern mining for query answering, we adopt the dynamic time warping (DTW) method for similarity measurement. We also propose the use of a query relaxation approach that recommends users change parameters of a given query to get an answer. Finally, we show implementation results of pattern query answering in a marine sensor network deployed in the South East of Tasmania, Australia. Pattern query answering system benefits in accessing and discovering knowledge from sensor data for decision making purposes.